The funk is something you cannot learn, buy or steal from somebody else. The funk is either with you, or it is not. You have to be honest and real. Enter Diazpora: they have the funk. It is with them since they started in 2002 and it has not deserted them since. This nine-piece band from Hamburg, Germany knows that you cannot fake the funk. You need to keep the groove on the move. On their fifth album “Islands” they do this more profoundly than ever. As with all things funky, it is about a continuous trip on an instinctive path that never leads to the final destination. Just like in real life: you got to keep moving! 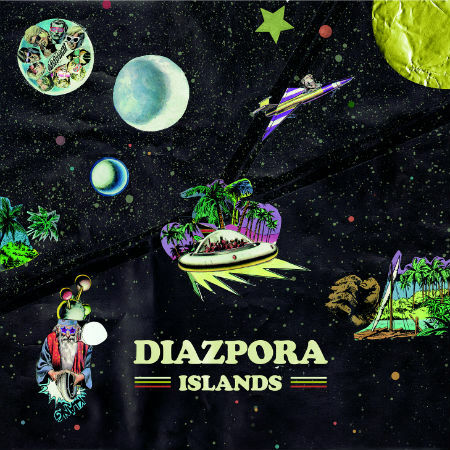 On “Islands” the Diazpora collective decides to throw a big party. Engineer Sebastian Nagel (also of The Mighty Mocambos) went for a straightforward analogue and purist sound. The album kicks off with the furious “Street Market”, very Blaxploitation, very Shaft, but still highly original – followed by “Beast”, another unstoppable signature tune. This band is a well-trained 18 legged groove machine, and with Axel Feige adding his truly unique vocals this is a very international sound. “Islands”, the title track, serves as proof and displays Diazpora’s ability to deliver a haunting ballad. “Kinshasa Strut” adds some powerful Afro funk to the whole set, while “Give A Little Prayer” explores cinematic funk territory, not far away from what The Olympians do. With “Moon” and “2 Much Effort” our heroes Diazpora continue in this vibe and get down to the nitty gritty 70s style. “Piece By Piece” then takes no prisoners. Rock, Funk and Afro appear in a perfect balance with Axel Feige’s engaging vocals. “Yaroslava” and “Me & I” are even more haunting, Diazpora deliver a stylistic scope unmatched by any other of their genre competitors “Nap Xtra Long” and “27-28-29″ prove the fact. “Numbers” closes off “Islands” with a powerful brass hook full of emotion and intensity. With this latest musical offering Diazpora certainly have the funk firmly in hand, hear it to believe it!